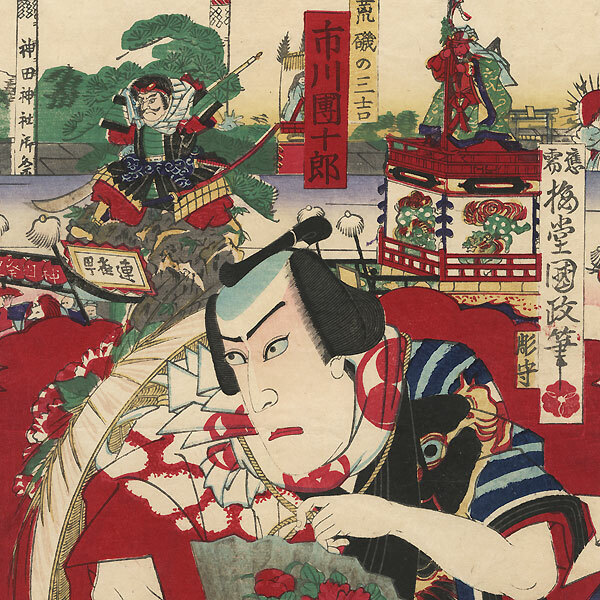 Comments - Terrific kabuki scene of people taking part in a festival, dressed to accompany a lion dancer. Each has a straw hat or folding fan decorated with red peonies, and the fellow at left carries wooden clappers. The beauty next to him and the woman at right are both wearing men's clothing, their hair pulled back into traditional men's topknots. A border of red clouds separates the figures from the procession, as colorful floats topped with three-dimensional figures parade down the street. 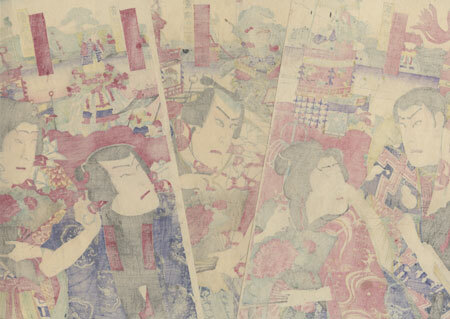 The actor in the center is Ichikawa Danjuro. A lively image of a holiday celebration with wonderful detail. Includes metallic pigment that has oxidized to a dark tone on the fans. Condition - This print with excellent color and detail as shown. Three separate panels. A couple small holes, repaired. Slight creasing, a few small marks. Please see photos for details. Good overall.